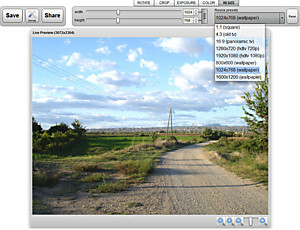 The photo resizer is a module inside goDromo Photo Editor that allows you to resize your photo easily. You will notice how the button will disengage and now you will be able to change both, the width and the height independently. If you want to lock the proportions again press ‘lock’. If at any moment you want to revert back to original settings press the ‘reset‘ button. If you ever want to back to the initial settings, simply press the reset button on the right of the toolbar.